It is easy to write about the cute, cuddly, cretins and beautiful, bodacious, birds that make up Scotland’s abundant wildlife. However this week I feel I should give mention to a rather unusual fish that has been in the news this week. The Sparling, a fish indigenous to Scotland, was once very common in Scottish rivers but now its numbers have seriously declined and it has to be said not many people even know about its existence, let alone the challanges it faces. If you put the word ‘Sparling’ in Google, you will find that the top listings have absolutely nothing to do with this small silver fish – but perhaps that is because they are better known as European Smelt (Sparling being the Scottish name for this uncommon aquatic vertebrate). They spend their most of their lives in the coastal waters around Western Europe, but in March (infact right about now) they take advantage of the high spring tides and these courageous little fish make their way upstream to spawn. Despite their ability to withstand the changes from salt water to fresh water, Sparling are actually pretty poor swimmers (not something I ever thought I’d find myself saying about a type of fish) and this has played a part in its elusiveness in British rivers. As the water quality in our inland waters has decreased, so the number of rivers in which Sparling can be found has reduced vastly, and now they are only found in three rivers in Scotland – the Forth, the Tay and the Cree. It was the fight to save the future of these fish in the river Cree that caught my attention this week as volunteers braved the river during the night to carry out important conservation work – I have to say, rather them than me! 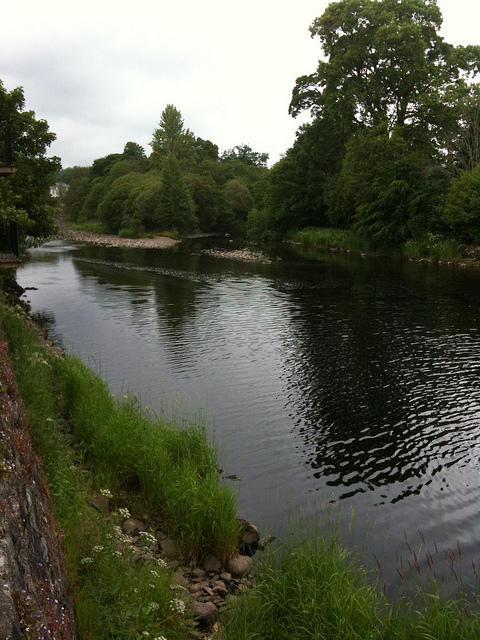 The river Cree, in the west of the country, flows from Loch Moan in the heights of the Glentrool Forest to exit into the North Channel not far from the bustling market town of Newton Stewart. It is the only river on the West Coast that still attracts Sparling to its waters, although the conservation work that is being undertaken includes an attempt to establish the nearby river Fleet as another place that they will spawn. This is great news, as Sparling were, for so long, an important part of the eco-system for many Scottish rivers and their visits support the survival of many other animals such as seals, goosanders and otters in the waters that they manage to continue to journey through. It seems odd, even to me, that the plight of this wee fish has caught my imagination, especially as I was not aware of it until this week – but I will definitely hold out hope for the survival of Sparling in the Cree and the success of its re-introduction to other rivers in Scotland! Previous Post(Scotch) Pancake Day!Next PostA Scottish Stig!